Because the dairy farm where he works is facing a labor shortage, Manuel Estrada said he hasn't had a real day off in about a month. Photo taken on July 25, 2017. Along a desolate country road in northeastern Wisconsin, Manuel Estrada speeds toward work in his rumbling silver Ford SUV. He's running late for his predawn shift. And he's worried. His boss is counting on him; she's been down a worker for a month. More than 400 Holstein cows stand blinking, waiting to be milked. His family needs the paycheck from his $11.50-per-hour job. And Estrada, 30, hopes the police aren't waiting for him too. It's a risk he runs regularly during his 15-minute commute from his home in Manitowoc, about 80 miles north of Milwaukee, to the 150-year-old family dairy farm where he's worked for two years. While he hasn’t been a perfect driver since he entered the country illegally 13 years ago, he has avoided any real trouble with police. From past traffic stops, he said, cops do know he shouldn't be driving a car. Estrada is an unlicensed driver, and the route passing through one of the top dairy-producing counties in the nation is his pressure point because, if he's picked up by police, he could have an even bigger worry than a traffic ticket. "What I am afraid of is the separation of family and being separated from my kids," he said in Spanish. "I don't worry specifically about Trump, because I know that I'm not a criminal." But he is in the country illegally, and that's what matters under President Donald Trump's agenda to ramp up deportations. Estrada's boss, Abby Driscoll, said she can't imagine the dread that Estrada and other employees face each day not knowing whether they'll make it to or from work. Even as she celebrated Trump's win as "the lesser of two evils," Driscoll tried to reassure anxious employees after the election, telling them to just stay out of trouble. In her mind, immigration and border security should be back-burner issues for Trump. "I was expecting some things to happen when I voted for Trump," she said. "As far as all of his immigration policies, I guess I wasn't expecting it to go as far as it did already." Abby Driscoll tends two of more than 400 dairy cows at her northeastern Wisconsin dairy farm outside Manitowoc, Wis. on July 25, 2017. Driscoll, who voted for Donald Trump in the 2016 election, said she wasn't expecting his immigration policies to go as far as they have. These are strange times in America's Dairyland. Wisconsin voters gave Trump the electoral bump he needed to claim the White House in the 2016 election, the first time since 1984 that a Republican presidential candidate won the state. As one of the state's largest industries and the core of its Cheesehead identity, dairy production is heavily dependent on immigrant workers. Driscoll and some other farmers say the Trump administration's immigration crackdown is making it harder to find workers. 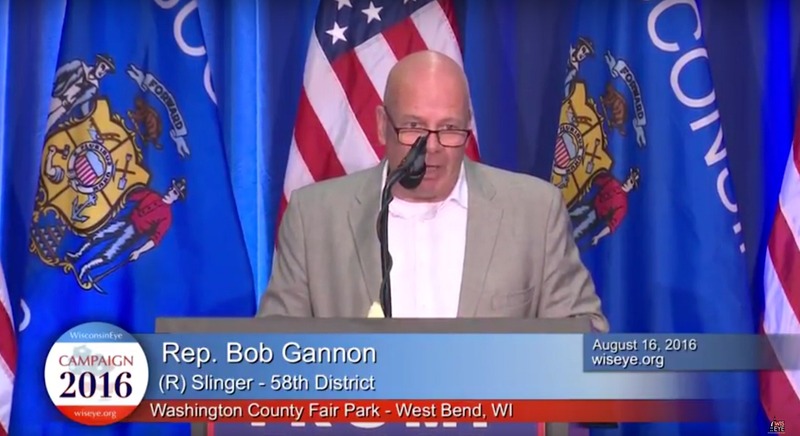 But if Wisconsin farms face labor shortages today because they've relied on workers in the country illegally, state Rep. Bob Gannon, R-Slinger, doesn't want to hear about it. "If it takes illegal immigrants to make their business model operate, I think their model is broken," he said. "I'm in agreement with President Trump that if you break the law in the United States, you should expect to get a one-way ticket out of here." He also has a problem with cities that don't do more to help the federal government. Gannon is a co-sponsor of a controversial Assembly bill (AB 190) aimed at preventing sanctuary jurisdictions of all types. Republican state Rep. Bob Gannon has co-sponsored a controversial bill that would penalize so-called sanctuary communities in Wisconsin. He is seen here in a 2016 WisconsinEye video from the Washington County Fair Park in West Bend, Wis. The bill and its companion measure in the Senate (SB 275) would ban local governments from prohibiting police from asking about a person's immigration status. The proposal also would require law enforcement to honor all "lawful" requests by U.S. Immigration and Customs Enforcement to detain people suspected of being in the country illegally. Communities that violate the law would be assessed a fine of up to $5,000 a day. The county was spending its own funds to detain people and couldn't justify absorbing the cost for low-level offenders. While many county jails contract with ICE for reimbursement, Milwaukee so far has not. Peggy Romo West, the supervisor who pushed the resolution and the county board's first Latina, said she did not want the county burdened with the time and expense of jailing petty criminals. But in her mind that doesn't make Milwaukee a haven from immigration enforcement. "For me, it's philosophical and financial, but just on the financial angle it makes sense," she said. "They weren't paying us per day what it was that we were spending. And so why should the citizens of Milwaukee County eat that cost?" "I don't know how any law enforcement official or public official — a mayor or a governor — can sit back with a straight face and say our communities are stronger because of illegal immigration," Clarke told Fox News' Sean Hannity in March 2017. His office rejects the county's stance on detainer requests. He keeps inmates behind bars whenever ICE agents ask, at an annual cost to the county of nearly $1 million to detain roughly 3,000 immigrants. 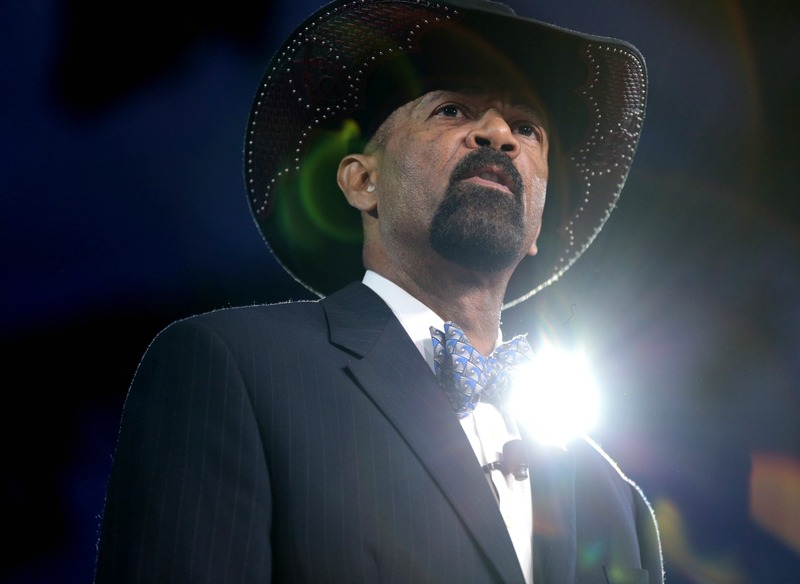 Milwaukee County Sheriff David Clarke has ignored his own county's policies against detaining illegal immigrants accused of minor crimes. The photo was taken at the Conservative Political Action Conference in National Harbor, Md. Feb. 25, 2017. Yet in the county seat, Milwaukee police are instructed not to "routinely" ask residents about immigration status if it would impede interviewing witnesses, filing of an incident report, conducting a criminal investigation or receiving a citizen complaint. Milwaukee Mayor Tom Barrett declined to say whether the city is or isn't a sanctuary, adding to the lack of clarity on where the city stands on the issue. But he emphasized that the city's focus is on safety and locking up violent criminals, and any power-grabbing parries by the Trump administration beyond that would be problematic. "If what they are trying to do is take our limited resources and move them from local law enforcement to federal law enforcement, I do have a problem with that," Barrett said. Milwaukee Mayor Tom Barrett is concerned about threats by the administration of President Donald Trump to remove millions in federal funding over the city's policy directing police not to "routinely" inquire about a person's immigration status. 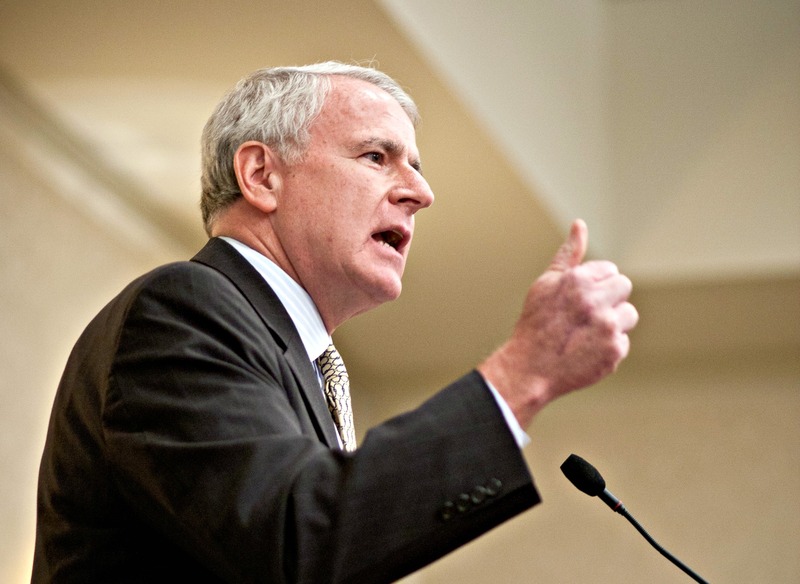 He is seen here speaking at the Concourse Hotel in Madison, Wis., in 2012. Chicago and Cook County, Illinois, for instance, prohibit on-duty officers from sharing information with ICE about a person’s immigration status. On Aug. 7, 2017, Chicago sued the Justice Department over its move to make sanctuary cities ineligible for its grants. In Philadelphia, New York City and New Orleans, police can't ask people they stop whether they are citizens. Philadelphia's top lawyer even accused the Justice Department of breaking the law by demanding that the city explain its policies. Sykes said immigration was never much of an issue for Clarke before the sheriff’s profile skyrocketed to national status. It didn't fully dawn on Sykes how entwined the state's dairy industry was with illegal immigration until late in his talk-show tenure. "This is not an economy that is being damaged by illegal immigrants," Sykes said. "We're really being kept afloat by it." As a 17-year-old, Estrada crossed into the United States from Mexico and ended up in Manitowoc "on a whim." Estrada's fight to keep their growing family together — they have a 3-year-old son together — is also her battle, which she has broadened to include rallies, marches and speeches. In her view, the issue comes down to basic issues for all families, such as the price of milk. Together, Manuel Estrada and his wife, Jennifer, organize their Manitowoc, Wis., community around farmworker advocacy. Photo taken on July 25, 2017. "If we don't want to end up paying $10 for a gallon of milk we need to start protecting our workforce and our community," she said. "These are people in our community that are living in fear." "They call this the dairy state, but it's thanks to the strength of the immigrants," he told the crowd. Immigrant dairy workers and their supporters, including Manuel and Jennifer Estrada, gather at the state Capitol in Madison, Wis. on June 28, 2017 to protest ramped up immigration enforcement policies under President Donald Trump and an anti-sanctuary proposal in the state Legislature. 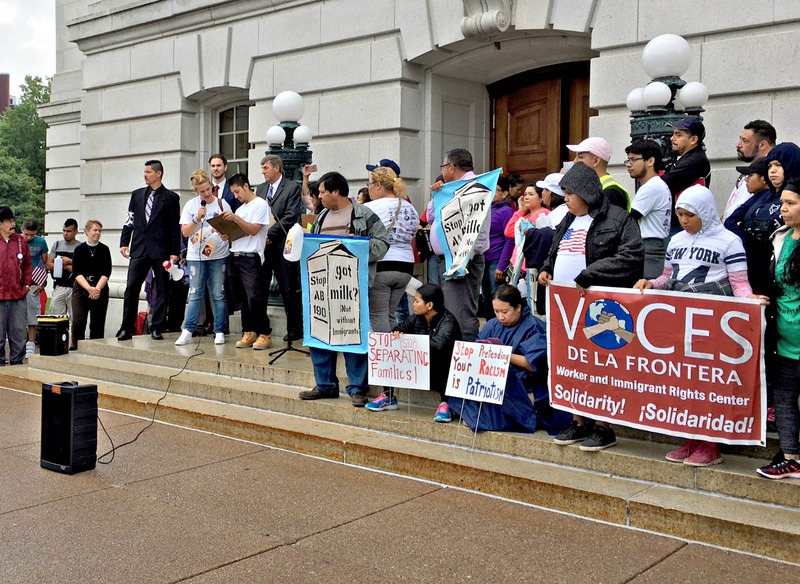 The rally was sponsored by the Milwaukee-based group, Voces de la Frontera. 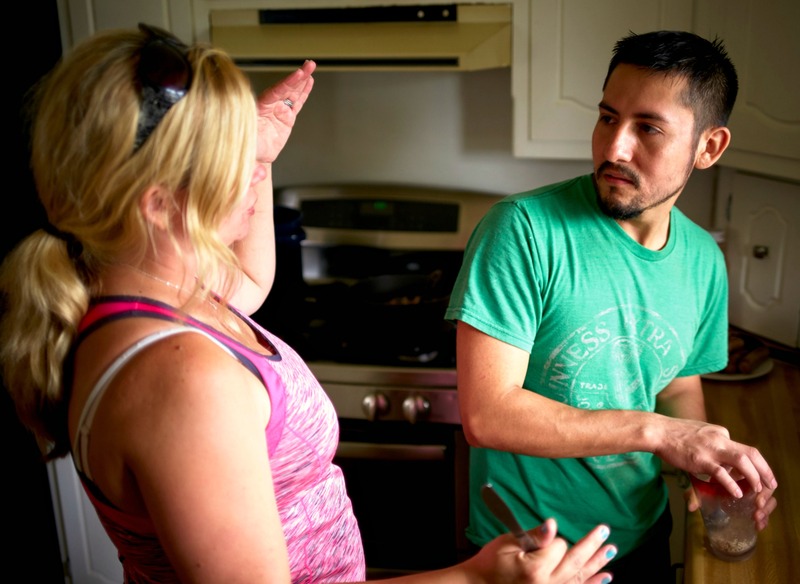 The Estradas have been married for more than a year and have applied with the Department of Homeland Security to adjust Manuel's immigration status. They feel confident that the government will grant them what they want. 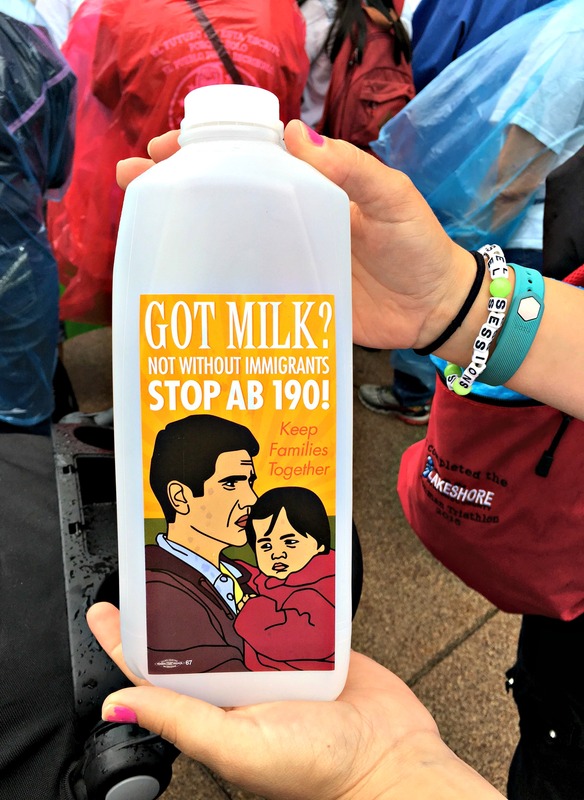 At a June rally at the state Capitol, immigrant dairy workers and their supporters protest Assembly Bill 190, which would penalize so-called sanctuary communities. Photo taken June 28, 2017 in Madison, Wis.
"He lasted for two hours," Guerrero said. "It's too hard for him." He hasn't had a real day off in about a month as the Driscolls' search for a new employee stretches on and on. Estrada had even quickly returned to work after a cow stomped on his hand. He paid the emergency room medical bills out of his own pocket. Driscoll said she wishes it wasn't this way. She'd like to hire legal workers and U.S. citizens. She doesn't blame employees such as Estrada for living in the country illegally, either. She applauds him for trying to adjust his immigration status through his wife. Manuel Estrada, a farmworker from Mexico, speaks with his boss, Abby Driscoll, at her family's dairy farm outside Manitowoc, Wis., on July 25, 2017. Estrada is in the United States illegally and faces heightened anxiety around detainment and deportation under President Donald Trump. For other employees, she does what she needs to verify that they can work legally in the country, but otherwise has a "don't ask, don't tell" policy. "We definitely realize that, you know, we are maybe turning a blind eye to it that some of these workers are in this country illegally," she said. And Estrada doesn't really blame Driscoll for voting for Trump. However, he did warn her after the election that she could be milking the cows by herself if Trump does what he says he wants to do. Listen to an audio version of this story by Reveal from The Center for Investigative Reporting. Alexandra Hall of Wisconsin Public Radio and the Wisconsin Center for Investigative Journalism contributed to this story, which has been edited from the original version written for Reveal from The Center for Investigative Reporting. It was distributed by the Wisconsin Center for Investigative Journalism, which collaborates with Wisconsin Public Radio, Wisconsin Public Television, other news media and the UW-Madison School of Journalism and Mass Communication. All works created, published, posted or disseminated by the Center do not necessarily reflect the views or opinions of UW-Madison or any of its affiliates.